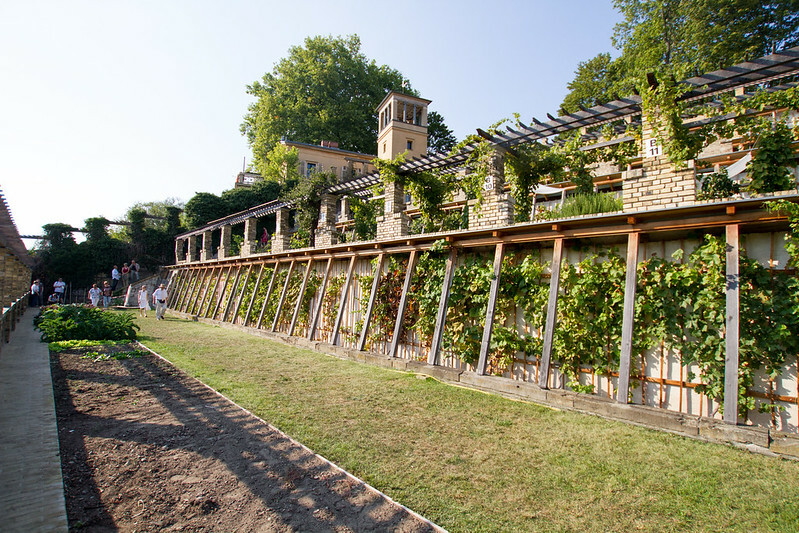 This project revitalised a forgotten vineyard, originally designed as an Italian-style landmark within the UNESCO World Heritage Palaces and Parks of Potsdam. The Winzerberg with its characteristic pentagonal shape is entered through a triumphal gate. A Tuscan-style wine-maker’s house is located above the terraced vineyard which was used to grow and cultivate grapes, fruits and vegetables for the Royal Court of Frederick II and his successors. The Winzerberg is owned by the Prussian Palaces and Gardens Foundation Berlin-Brandenburg (SPSG), who provided key partnership and supervision to the project. The project was initiated, planned, conducted and completed by Bauverein Winzerberg Potsdam, a small and independent non-profit-association. Bauverein Winzerberg Potsdam’s members include individuals with various professional backgrounds, including those from the field of cultural heritage. The majority of work was carried out by thousands of helping hands including craftsmen, scientists and businessmen as well as students, apprentices, volunteers, refugees, pensioners and people with disabilities. The jury appreciated this aspect of the project highlighting “the involvement of local people from Potsdam in the management of the site”. The project is an excellent model of a grassroots initiative, with the bulk of its financing coming from crowdfunding. Donors could for example, buy a pane of glass for the restoration of the Winzerberg, with each pane costing € 30.00. The donor’s name would be inscribed on the pane of glass, encouraging a sense of ownership for the heritage site in the local community. 5,000 panes have already been sold and further panes are still in strong demand. From 2005-2015, the Bauverein Winzerberg Potsdam succeeded in restoring a 300-year-old monument in the center of Potsdam and returning it to use for both citizens and visitors to the city. Great efforts have been made by the association to maintain and enhance the architectural substance of the Winzerberg. The gardeners replicate the historic methods of gardening when possible, including the cultivation of the varieties of grapes and fruits which were originally grown. The resulting products are sold at the local market or enjoyed by the visitors and volunteers. The jury commended the project for having “saved a completely derelict site from being lost forever. The sites new social and civic uses are respectful of the existing garden space. This is an excellent restoration project that enhances a prominent World Heritage site of European importance, combined with successful and visionary civic engagement, which is of great importance to Potsdam, with the inclusion of 4 different academic institutions, and with a variety of volunteer activities”.